Stand out while on the road! 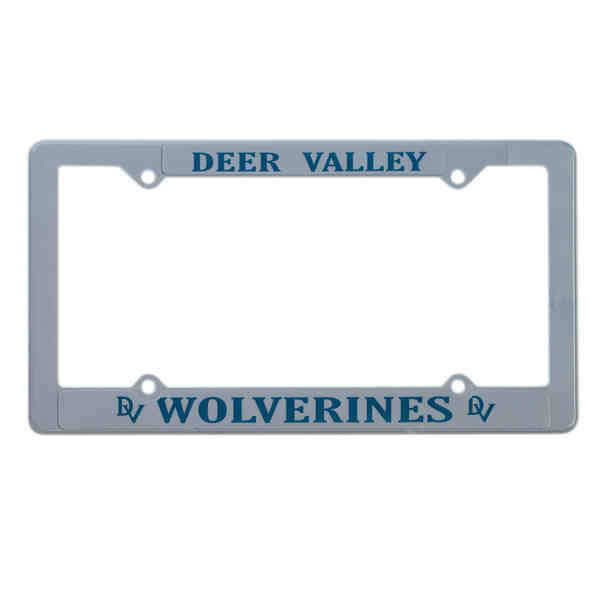 This economy, full view license plate frame features four holes and is designed to meet all state requirements. Fits most cars for widespread brand exposure! Please note holes may interfere with copy on 4-hole frames and it is the responsibility of the customer to fit the frame on the car and prevent the style from covering registration stickers and other information. This license plate frame is union made in the USA. Size: 12 7/16 " x 6 11/16 "
Imprint Size:9/16" x 10 3/4", 3/8" x 6"
Ship Weight:16 lbs, Please contact us for shipping estimates for orders over 200 pounds. Frames are reversible - please specify if narrow side should be on top or bottom.